The Ultimate in Vermont Country Living! Close enough to everything the mountain but still far enough away from it all. This 3500 square feet, three-level secluded home is available for year-round long and short-term rental. 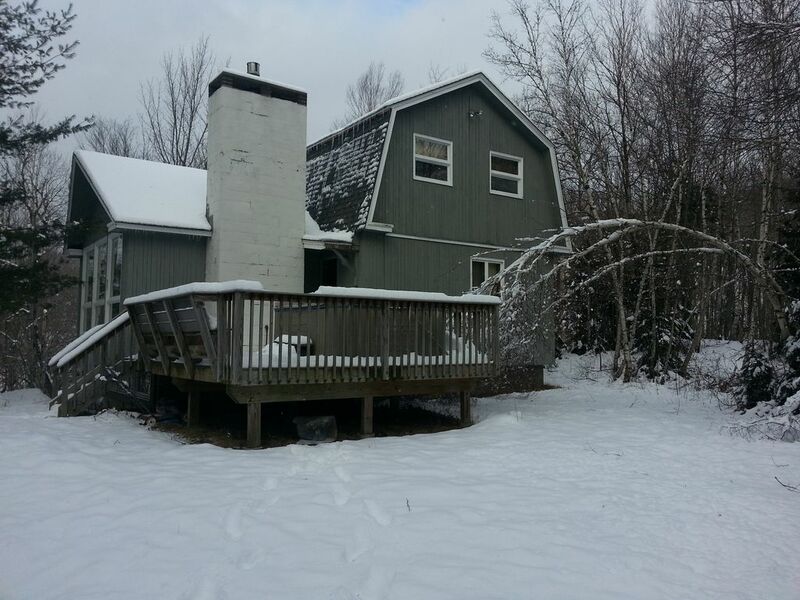 Located one and half miles from Mount Snow, this two acre property provides you with all the luxuries of modern living, located only minutes from on of the premier ski resorts in Vermont -- Mount Snow! The interior of this home was constructed with the elements of an antique barn and this shows in the open and quaint floor plan. With six spacious bedrooms on three floors and two full baths, this home sleeps 12 people comfortably. The separate game room will provide hours of entertainment and is well equipped with, television, VCR, and foosball table. After a long day of skiing or snowboarding, the 6-person outdoor hot tub is sure to relieve those aching muscles. From there you can relax in front of the gas fireplace enjoying spectacular mountain views of Mount Snow. Enjoy the best that Vermont has to offer! This country style home is a wonderful year round retreat. If you are considering a vacation in Vermont, this is the place for you! A rare exceptional rental opportunity, that will be hard to beat, this Vermont country home is perfect for one or two families. Sorry, no pets! -- Sorry, no smoking on the property. Activities (on site or nearby): Hiking, Biking, Golf, Tennis, Fitness Center, Fishing, Hunting, Horseback Riding, Shopping, Restaurants, Cinemas, Sightseeing, Swimming, Water-skiing, Rafting, Downhill Skiing, Cross Country Skiing, Snowmobiling, Sledding, Wildlife Viewing, Boating, Sailing. 6 bedrooms, 2 baths, sleeps 12+. Bedrooms are configured as follows: Bedroom 1 - (1) Queen. Bedroom 2 - (1) Full. Bedroom 3 - (1) Full. Bedroom 4 - (1) Queen and (1) Twin. Bedroom 5 - (1) Full. Bedroom 6 - (2) Twins. Gas burning fireplace, phone, 3 TVs, DVD, Cable TV, VCR, fully equipped eat-in kitchen with microwave, dishwasher, refrigerator, cooking utensils provided, charcoal grill (BBQ). 6 bedrooms, 2 baths, sleeps 12+. Dining area seats 14, large living room with field stone gas fireplace. Separate family room with foosball and TV. Hiking, Biking, Golf, Tennis, Fitness Center, Fishing, Hunting, Horseback Riding, Shopping, Restaurants, Cinemas, Sightseeing, Swimming, Water-skiing, Rafting, Downhill Skiing, Cross Country Skiing, Snowmobiling, Sledding, Wildlife Viewing, Boating, Sailing. We are 1.5 Miles from Mount Snow. We are 1.0 miles from the movies and shopping. It was a great weekend house in ideal location for us and our friends, and the owners were easy to work with. My friends and I had a wonderful stay. Don was so responsive to questions prior to the stay. The house was in a great location close to the slopes. It provided a good space for us to relax by the fire or play foosball in the game room. We are very happy that you enjoyed your stay. Please come again. Our group had a great time at this location. The hot tub was a nice addition. Amenities were close, and couldn't of asked for a more convenient location yet, had some privacy. Thanks for the opportunity to rent! Thanks for being a great guest. We are always glad people have a great time! We were looking for a large house for Reggaefest. This house was perfect for a large group of friends. There were 12 adults, there was plenty of space, and we never felt crowded. The hot tub was awesome to come home to after skiing. Don and Faye were a pleasure to deal with, and always answered emails back quickly. Look forward to booking again! Thanks again. We love to have great guests like you! Second stay as great as the first! A group of 12 recently stayed at this property for an extended weekend and had a fantastic time! This was our second stay in 3 years, and everything was as great and enjoyable as the first go-around. The house is plenty spacious for a large group and is in a very convenient location, minutes away from gas, groceries, restaurants, and Mount Snow. Don & Faye are great owners to work with -- quick to respond and very accommodating. They granted us a late checkout on Monday (the day after the Superbowl) so we could get some decent sleep before tidying up and driving back in the morning! I can't recommend this place enough. We'll be looking to return again next year! Exactly what we were looking for. Outdoor hot tub was so much fun. Would be great for a group with couples since there are so many rooms. Close to the mountain and an easy drive, don't have to deal with any of the smaller roads, which can be treacherous. Would definitely recommend! Thank you so much. I think you summed it it really well. We are 1/2 mile from Route 100 on which the MOOVER runs to the mountain. We are very close to the VAST trails for snowmobiles. Ski: We are 1.5 miles from Mount Snow. About a 5 minute drive. We reserve the right to allow a Real Estate Broker to show the house during a visit. We apologize for any inconvenience this may cause.